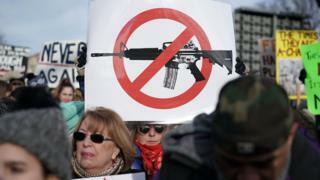 The White House said on Tuesday Mr Trump's advisers would recommend that he veto the bill as it would apply "burdensome requirements" that were "incompatible with the Second Amendment's guarantee of an individual right to keep arms". The Bipartisan Background Check Act seeks to close loopholes that allow people to buy guns without being subjected to a federal background check - under current law, private purchases are excluded from those checks. "This bill delivers that change: ensuring that people who are a danger to themselves and others cannot purchase a gun and perpetuate violence in our communities," Speaker Nancy Pelosi said. But Representative Doug Collins, the top Republican on the House Judiciary Committee where the bill originated, said the legislation was ineffective because it "foolishly presumes criminals who flout existing laws will suddenly submit themselves to background checks."